The 4255 and 4275 LCR Meters provide economical, thorough and accurate testing of any passive component at frequencies up to 1 MHz. Users include designers of passive components, manufacturing test, designing and testing materials, goods inwards inspection as well as circuit designers evaluating component characteristics. Both instruments in the range are designed for comprehensive testing of components, with a basic accuracy of 0.1%, at a low price. A wide range of measurement parameters can be selected. 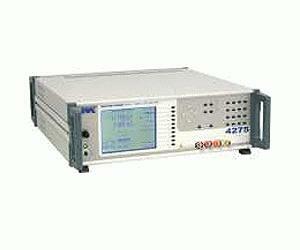 The 4255 LCR Meter is the entry level instrument covering to 500 kHz whilst the 4275 covers to 1 MHz.